The need for after-school care for students of working parents has resulted in the significant growth of our Auxiliary Programs over the past several years. Beyond 3:20, as many of our students gather their things to head home for the day, others look forward to activities of a different kind. Trinity is as busy a place after dismissal as it is during the school day. The After School Activities Program (ASAP) offers a wide range of enrichment opportunities for students in Prekindergarten through Grade Four. 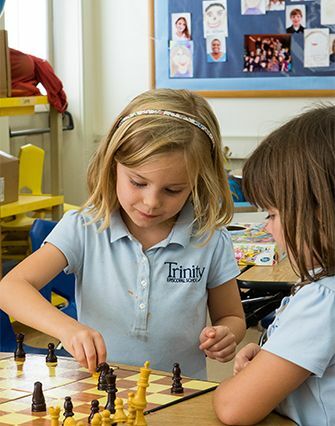 Six-week sessions are held four times per school year, with activities beginning at school dismissal and lasting until 4:30 p.m. Students use the opportunities provided by ASAP to explore new subjects or to delve deeper into special areas of personal interest. ASAP delivers a host of activities to campus, such as yoga, chess, ballet, rocketry, opera appreciation, and sports. The Cottage is our Lower School after-care program. It is available to all Prekindergarten through Grade Four students. The program runs from 3:20 until 5:30 p.m. Families can sign up for the school year at a semester rate or as occasional users at an hourly rate. The Cottage offers arts & crafts, games, field play, and snacks, as well as homework help for Grades One through Four. Our Middle School After-school Study Hall (MASH) is available to Middle School Students in Grades Five through Eight and lasts from school dismissal until 5:30. MASH is facilitated by Trinity faculty members who are available to assist students with homework. Students may attend MASH on a drop-in basis and are charged an hourly rate.